Service 94 year in Pudasjärvi ! Commercial Counselor Janne Rajamaa and his first shop, "Bag trade Box", dating from 1905. In 1924, the Commercial Counselor set up the first "stone trade" to Pudasjärvi "Onnela's Corner". 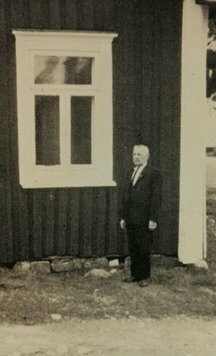 In 1936, the main business house in Pudasjärvi. Current business space in Pudasjärvi. The properties have been duplicated and the name has changed (Rajamaa, Pohjanmaa, Prima, Spar, M-Tavaratalo). Picture Jenni and Janne Rajamaa on the opening day of the department store. The opening of Rajamaa Oy's department store. Jaakko Rotonen, Janne Rajamaa, and Paavo Toivonen. There were up to 12 stores in Rajamaa! .Chairman of Rajamaa Oy's Executive Board, store manager and assistant v.1925, opened at Puhos's store in 1969. The family owned by the border was in the year 1974, when it became a wholly owned subsidiary of Pohjanmaa Oy. By the transaction of 1 March 1986, Jouko and Irene Ranua acquired their business for themselves (T-Market Prima, SPARmarket Jouko Ranua Oy). On January 1, 2007, Irene and Jouko Ranua's sons Jyrki, Jari and Tapani Ranua became entrepreneurs. With the last change of ownership, the business joined the M-ketju owned by independent merchants. Thus, with the exception of Ostrobothnia, the business has been fully localized throughout its history.